My life is busy! With two kids, a husband, and our dachshund Louie, my family is always on the move. We live in Plano and moved here just a few years ago when my company relocated their headquarters to North Texas. My husband works from home, my kids go to school in Plano, and I work in downtown Dallas. I was worried when we first moved to North Texas that we would be extremely dependent on cars. But that’s not the case with DART. Let me tell you, in this household mornings are nuts! After breakfast, our family does the carpool and drop-off rounds. Luckily, I am able to make the most of my commute (and get a little quiet time) when I hop on the Red Line. I look forward to the commute most days. I can check my email, catch up on the latest news, and make a schedule for the day. Getting to work reliably and affordably each morning takes a real burden off of my shoulders. One of the reasons I’ve enjoyed our move to North Texas is being able to feel like I can live anywhere in the region and still make it to my job. In fact, over 1 million jobs are walking distance from DART bus or rail. With more companies like mine moving to North Texas every day it’s important that people have the option to choose how they travel. 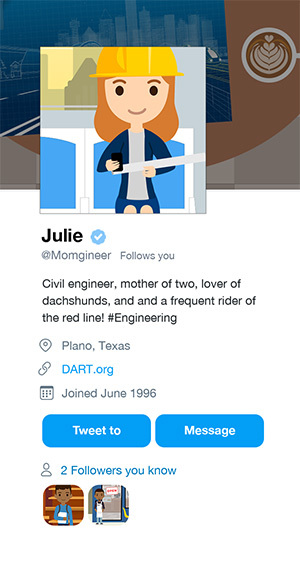 I don’t love DART just because of my commute, I’m also a civil engineer and see the impact that public transportation has on new development and making our city a friendly and flexible place to live. I work developing infrastructure like roads, bridges, and tunnels but I also see how critical other types of infrastructure are as well. For example, having a multi-modal transportation infrastructure is critical to supporting the economic and mobility health of our region. I am proud to be a North Texan and excited to see our community and our transit options continue to grow!